The opening, set in 1963, shows the final moments of a man about to be executed. 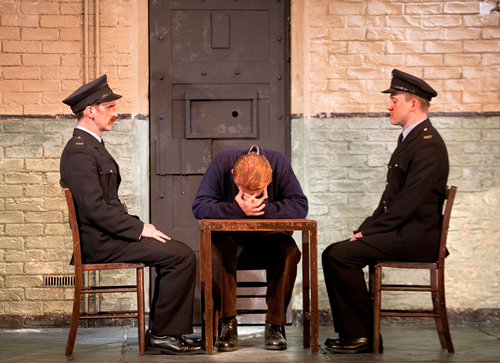 His sparsely furnished and dark prison cell gives the scene a grim backdrop, however once the convicted man starts to protest that he is innocent the play takes a completely different turn. Morbid the situation may be, and I'm sure he isn't the only man ever to challenge the conviction in his final minutes, his interaction with the hangmen is so absurd that you can't help but burst out laughing at the poor man's misfortune. This sentiment is very much how this production continues; serious situations cranked up for laughs and, surprisingly, it completely works. Two years after the man's unfortunate ending the death sentence has been abolished in the UK and the second-best hangman in the country, Harry Wade (David Morrissey), is now running a pub that receives a steady flow of peculiar visitors coming by for a pint and a chinwag. This could already provide plenty of material to fill a good two hours in the theatre, however the play is made even more fast-paced than it already is by adding an intriguing element dating back to one of Harry's final hangings. And when a newcomer (Johnny Flynn), quickly nicknamed Babycham Man by the locals for his London accent and youthful looks, makes an appearance in the pub, the speculations only increase – with morbidly hilarious results. This snappy dark comedy sizzled with a quick-witted dialogue by writer Martin McDonagh (The Lieutenant of Inishmore, The Cripple of Inishmaan) and twists and turns around every corner. I thought I had the plot all figured out by the end of act 1, and I was already patting myself on the back for predicting where the story was going, when act 2 opened and I realised I couldn't have been more wrong. The unexpectedness of the play and the fast pace at which the twists unraveled, supported by some fantastic performances and memorable one-liners (such as Harry arguing that hanging is better than death by guillotine, which is messy... and French), really kept me on the edge of my seat throughout. While Morrissey's stubbornly old-fashioned Harry and Flynn's menacingly charming Mooney were the undeniable stand-outs in this play, the supporting cast worked flawlessly in tandem to create an exciting and electrifying piece of theatre. There were some stunning stylistic choices as well, particularly in the first scene and the set change early on in act 1 and I only wish there has been more of that as the play continued on, as there was a wealth of opportunity with the scope of the set on stage and I almost felt as if they missed a chance by not fully utilising this for the duration of the production. Other than that this play was spot on though, I don't think I have ever laughed so much at such a morbid subject matter. The darkly funny Hangmen is filled with sharp writing and an even sharper delivery by a unanimously excellent cast, creating the epitome of gallows humour – literally and figuratively. Hangmen is running at the Royal Court until 10 October 2015. You can book tickets here.